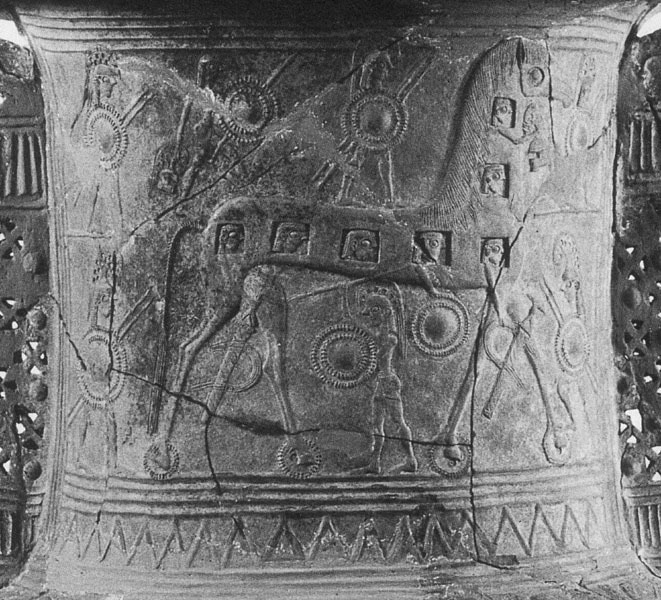 This vase - from about 675-650 BC - depicts a horse on wheels. If you look closely, you can also see something else: Greeks inside (and outside) the object. Image copyright Mykonos Archeological Museum, all rights reserved, and online via Beazley Archive at Oxford University. Provided here as fair use for educational purposes. Still unable to subdue the Trojans, Odysseus and the Greeks (Achaeans) needed to find a way to surreptitiously enter the fortified town. They learned, from Helenus, (a Trojan seer), that in order to defeat Troy, Neoptolemus (Achilles’ son) would have to join the Achaean forces. Helenus also told the Greeks they would not win the war unless they stole the sacred Palladium - a wooden statue of Athena (called Minerva by the Romans) - which was said to have fallen from heaven. As long as that statue stood in Troy, the Greeks could not take the city. On a dark night, Diomedes (with the help of Odysseus) climbed a wall of Troy. Once inside the city, Diomedes stole the Palladium, thereby weakening Troy’s defenses. Epeios (it is said) created a wooden horse big enough to hide many Greek warriors. Leaving the horse outside the gates of Troy, and moving their ships out of view, the Greeks fooled Priam and his subjects into believing their enemies had given up. Thinking the siege was finally over, the Trojans (ignoring the warnings of a suspicious few) brought the horse inside the gates. They, in other words, did to themselves what the Greeks had been unable to do for ten years. At night, while the Trojans were sleeping off the effects of their drunken celebration, Odysseus and his fellow warriors, including Achilles' son Neoptolemus, exited the wooden horse and opened the city gates. The remaining Greek warriors entered the city and overran the former stronghold. Too late, Priam and his subjects realized they themselves had opened the door to ruin. Neoptolemus found Priam near the altar of Zeus and killed the old man. He also hurled Hector’s young son, Astyanax, over the city’s wall. With the death of Polyxena, the Trojan War (also memorialized by Ovid) was finally over. Bos, Carole "THE WOODEN HORSE" AwesomeStories.com. May 01, 2004. Apr 20, 2019.